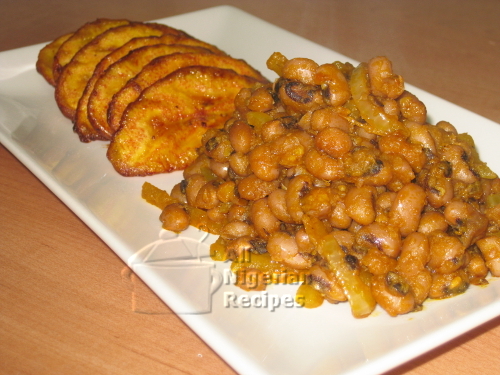 Nigerian Fried Beans is so delicious that even those who do not like beans enjoy it! The closest Nigerian meal is Ewa Agoyin. I usually soak beans in cool water overnight. This greatly reduces beans bloating and upset stomach associated with eating beans. The next day, chop 1 onion into thin slices, cut the other one into 4 big chunks then pound/grind the pepper. Rinse the beans and put in a sizeable pot. I rinse it twice. Pre-cook the sliced onions with a few drops of water to soften them a bit. Set the pot of beans on the stove. Add the stock cube (crushed) and the chunks of onion. Add enough water to cover the beans and start cooking. Cook the beans till very soft, adding water when necessary. Always keep water to the same level as the beans so that by the time the beans is done, there will not be too much water in the pot. Note: If you have a pressure cooker, use it to cook the beans till soft. I normally use my pressure cooker for beans but for this recipe, I prefer a normal pot so that I can have more control, especially towards the end. When the beans is done, add salt, leave to dry up all the water and transfer the beans to another container. Now, set a dry clean pot on the stove, pour the palm oil and heat it up till the oil melts (if congealed). Note that you should only heat it up, not bleach the oil. You will know it is hot enough when a piece of onion dropped into the oil sizzles. Add the precooked onions and stir for a bit. Add the ground Habanero pepper and stir till everything is heated up very well, at most 2 minutes. Add the beans and stir for about 2 minutes. Add salt if necessary. Cover and leave to simmer for about 2 minutes and it's done. Serve with the Fried Plantains, Soaked Garri or bread.